A couple of months ago, there was a Twitter discussion about SFF awards that touched on the question of why so few Worldcons have been held outside the United States. While we might debate the wisdom of a group of American fans calling their convention "Worldcon", we are probably stuck with the name for the foreseeable future (and if more international bids win, it may even become more accurate). Setting that aside, one common response to this criticism is that Worldcon can only be held in a location that bids for it. You can't win if you don't play, as they say, so it's not the larger membership's fault if very few Worldcons have been held outside of the United States. There are a number of reasons why this analysis is too simplistic, but it also got me to wondering: how often have groups outside of the US, particularly from outside North America and/or non-English-speaking countries, bid for Worldcon and lost? Is there a history of non-American bids not doing well? So I took to the internet. Surely there had to be a list of losing Worldcon bids out there somewhere, right? But there wasn't. The best I could find was Fancyclopedia 3, which has entries detailing the site selection process for almost every year that Worldcon has been held. So using that information -- and my sincerest thanks to the editors of that site for compiling it! This project would not have been possible without them -- I built a list. I've compiled that list into a Google Sheet, accessible here for anyone who wants to see the data for themselves. Some quick background for anyone who is unfamiliar with how bidding and site selection works: each year, the location of a future Worldcon is chosen by popular vote of the members of the World Science Fiction Society (WSFS), during that year's Worldcon. There are two types of members: Attending Members and Supporting Members (who pay a smaller fee that entitles them to nominate and vote for the Hugo Awards as well as participate in site selection). For more about the process, see the WSFS website. Currently, the membership votes on a future site two years in advance; in the past, site selection has been undertaken one or three years in advance. So this year, members of the San Jose Worldcon have the option to vote on the location for Worldcon in 2020. The methods of voting have also changed over the years, with remote voting options, (by mail or online), having only been added fairly recently. As of this writing, there have been 75 Worldcons. Worldcon 76 will be held in San Jose this August, and Worldcon 77 has been awarded to Dublin, Ireland in 2019. However, the data will reflect only 76 site selections because the first Worldcon in New York City, named the World Science Fiction Convention after the 1939 World's Fair, wasn't really "selected" as such -- at the time, it wasn't planned as an annual event. A few months later, at Philcon (a regional con in Philadelphia), the fans in attendance decided to have another Worldcon and chose Chicago as the site. Because Chicon I was the first site selected for a continuing event called "Worldcon", that's where I started counting. One complicating factor in compiling this data is that it can be unclear to determine which bids are serious. If a group of fans hold public discussion about bidding for Worldcon, but then never submit a bid for consideration, does that count as a serious bid? To further complicate matters, the Worldcon community has a history of putting together hoax "bids" that are an excuse to hold a party, a joke based on a past bid (see Minneapolis in '73 for a better-known example), or some combination of the two. So I had to decide which bids (or groups that put themselves forward for consideration before there was a formal bidding process) counted as a "serious" bid. I ended up including every bid that appeared on the ballot (including at least two avowed hoax bids), every bid that received a significant number of votes, and every bid that was submitted formally but dropped out before voting could begin (as reported by Fancyclopedia 3). When the answer was unclear, I erred on the side of including a bid. 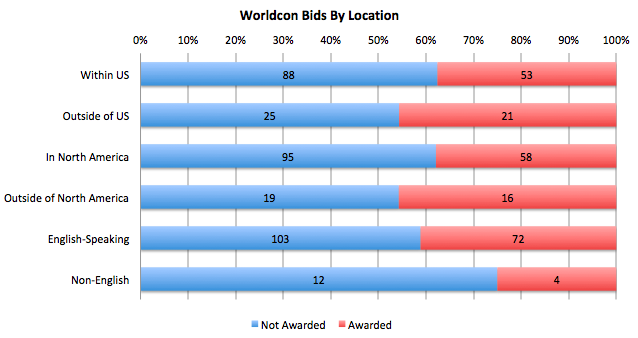 For 76 Worldcons, I counted 192 significant bids based in 69 different geographic locations. So what's the geographic breakdown? Including the 2019 con in Dublin, and the first Worldcon in New York City, there have been 56 US Worldcons in 26 different locations, and 21 outside the US in 12 different locations. Of these, 16 have been outside North America, and only 4 in non-English speaking countries (Japan, the Netherlands, Germany, and Finland). The cities with the most bids are Chicago, New York City*, and Los Angeles**, tied at twelve apiece, and Chicago has hosted more Woldcons than any other city, seven. The city outside the United States that has hosted the most often is Melbourne, with four Worldcons. Toronto and London have hosted three times, and Brighton and Glasgow have each hosted twice. In contrast, 14 US cities have hosted more than one Worldcon. Added together, these cities have hosted 44 Worldcons -- more than twice as many as have been held outside of the US. No Worldcon has ever been held in Africa or Latin America. If New Zealand wins its currently-unopposed bid for 2020, it will be the first time that back-to-back Worldcons will have been held outside North America. How have international bids fared in comparison to US bids? If you look just at the numbers, pretty well. Of 116 failing bids, 89 were definitively based in the United States, and only 25 were outside. The first several times non-US groups were serious contenders to host Worldcon, they were successful -- no non-US group lost a bid on the formal balloting system until 1981, when Sydney and Copenhagen lost to Baltimore 1983. If you look at the percentages, non-US bids and non-North American bids actually do better, with 46% of such bids being successful, as opposed to 38% of United States and North American bids. However, this is distinctly not true of bids in non-English speaking countries, which have only been successful in 25% of cases. But of course numbers don't tell the whole story. One thing that struck me in reading through the history of various Worldcon bids on Fancyclopedia 3 is just how insider-focused the whole process was. Stories of fannish drama abound, and backroom dealing, and fannish infighting. (My favorite story comes from the 1969 site selection, when a fan supporting the Columbus, OH, bid moved to St. Louis to "keep an eye on" the fandom there. Apparently, this fan became so well-liked that the opposing sides stopped fighting, and St. Louis won the final vote 393 to 5.) 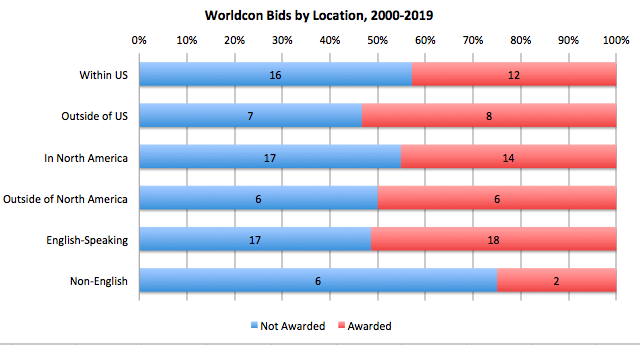 In the face of such an insular community, no wonder it took decades for fans outside of the United States, particularly North America, to start putting together Worldcon bids that were seen as more than a novelty. But there are indications that things may be changing. Since 2000, the winning percentage of non-US and non-North American bids has increased, to 53% and 50% respectively (non-English speaking countries held steady at 25%, or 2 successful bids out of 8 total). In part, this can be attributed to fewer bids being filed -- US, North American, and English-speaking-country win percentages have also gone up -- but even more, it's a sign of the changing demographics of the WSFS membership. As more people from other countries become members, and especially with increasing numbers of Supporting Members, more of people are likely to vote and to support international bids. With seven non-US and five non-North American Worldcons in the last twenty years, and two more about to come, it sure looks like a trend. Still, if the past few years have taught us anything, it's that progress won't keep happening on its own. You can't win if you don't play, but you can't play if no one will let you have the ball. We have to be the change, and guard against backsliding or backlash, by making sure that international bids, especially those outside North America and/or in non-English-speaking countries, get whatever support they need -- including our votes. And then maybe Worldcon can finally live up to the promise of its name. *New York City appears to have 10 bids in the chart, but there were two competing New York bids in 1953, one styling itself as Queens and the other as "the Greater New York area", neither of which is counted in that total. **Los Angeles was also a proposed location for "Pan Pacific Con", an unsuccessful bid from 1968 that proposed simultaneous cons in LA, Sydney, and Tokyo. Interesting! Thanks for the information, and that makes sense. So it sounds like the definition of "North America" has changed over the years -- one definition under the old rotating zone system, and a new one now.